I’ve written at least a dozen blog posts in my head over the last few weeks and not a single one has made it on to my computer. I go back and forth between different topics… what I want to do with this space (it must be time for my quarterly blog identity crisis), various thoughts I’ve had about being a mom to a girl, struggles we’re having with both kids, and, of course, the job thing. But when I start composing the lines in my brain, it all just comes out really sad or really dramatic, sometimes both, and I’m sure people are sick of me being the sad girl all the time. The Debbie Downer. We’ve had a few bones thrown our way in the last few months, including a position we were sure was going to end in an offer (it didn’t) and another position that was introduced with the words, “there will be an offer. You WILL BE getting an offer” (there wasn’t). And life moves on in the same way it has for nearly a year now. Friends are moving in to new houses. With yards. Or getting good, life-changing news of their own. And I say, “hey, that’s great for you!” while wishing I had some good news of my own to deliver….and trying not to be too jealous. But this is where we are and as sad as that sounds, it’s also been a good thing. For better or worse, this is where we are. 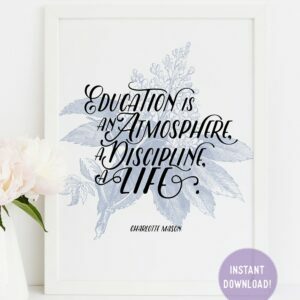 In preparation of B’s kindergarten starting next year (just after he turns six), I’ve been researching different homeschooling approaches and the winner right now is Charlotte Mason. Amidst the archaic language and some strange ideas (“Everybody knows that children should not eat pastry, or pork, or fried meats, or cheese, or rich, highly-flavoured food of any description; that pepper, mustard, and vinegar, sauces and spices, should be forbidden…“), I’ve discovered some gems of homeschooling theory, including an enormous emphasis on letting children under the age of six play outside as much as humanly possible. It’s been so hard to read. My land envy is ten times greater today than it was when I wrote that post and continues to grow exponentially as B himself grows. We have no yard and no place for our kids to just roam free in the sunshine and I absolutely hate it. I hate the fact that we were in the process of buying a house with a yard when this whole jobless situation happened. And I hate the fact that real estate and rentals in Denver are so ridiculously expensive right now that we couldn’t afford anything even remotely close to what we want even if E had an amazing job. But here we are. We’re stuck in Denver. We’re in a townhouse with no yard. And that’s what we have to work with. So I read Charlotte Mason and I do the best I can with what I have. We go on walks and hikes. I take them to the bird park. We obsess over the birds at our feeder. We watch chrysalids form in a cup in our kitchen. We plant tomatillos in a pot on our patio. And we look at a lot of books about nature. I know it’s not as good as simply sliding the patio door open in the morning for them to spend hours in the sunshine, but it’s something. And strangely enough, I’ve found some peace in this. That maybe we’re teaching B a valuable lesson in finding contentment with where you are in any given situation. That things can’t always be ideal or look as you want them to, and that’s okay. That good can be found in any situation, not just the “perfect” ones. It’s a good lesson for me, too. I can’t give him a yard right now, but I can show him what it looks like to hold on to the hope of a yard some day and make the best of where we are right now. That he can see his mama smiling even though she’s sad he doesn’t have any idea what a mud pie is and doesn’t like getting dirt in his sandals. I just really have to hold on to that hope of some day and know that today, this moment, right now, even though at times it all just feels so awful when all the thoughts start piling up on each other, that I truly, truly have so much to be thankful for. And I can just be in the here and now. Not where I should be. Not even where I want to be.